Fully Certified licensed and Insured Inspectors, Xpert Environmental Services Inc. has on its staff, and Council Certified Indoor Environmental Consultants. Xpert Environmental Services has been involved in projects concerning all aspects of Indoor Air Quality – Testing / Assessment / Remediation and Consultation. Xpert Environmental Services has conducted Environmental Inspections for Multi Million Dollar Commercial real estate transactions, Residential Homes, Condominium Complexes, Hotels and Resorts, Commercial and Industrial Properties, law firms, Medical Facilities and Schools . Xpert Environmental Services has conducted projects in health related industries, such as, Medical Centers, Day Care Centers, Nursing Homes and Special Service Centers. Xpert Environmental Services Inc. has participated in contamination cleanup projects involving hurricane Disaster response and recovery, from hurricanes through out the entire state of Florida and Louisiana. 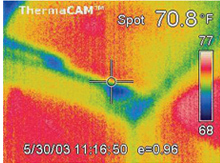 FLIR ITC Thermographer Infrared Building Science Certified. Fully Certified licensed and Insured Inspectors. Member in Good Standing Better Business Bureau. FEMA Response and Recovery Disaster Housing Inspector. Certified by Environmental Solutions Association ESA. Level 1 and Level 2 Microbial Assessment. Certified Mold Remediator by The National Association of Mold Professionals. Certified by the Certified Mold Inspectors and Contractors Institute CMICI. Certified by Professional Laboratories Mold Inspector. Certified by Environmental Microbiology Laboratories.